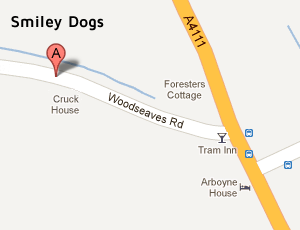 Smiley Dogs - Dog Grooming & Training Services. A warm welcome to SmileyDogs. 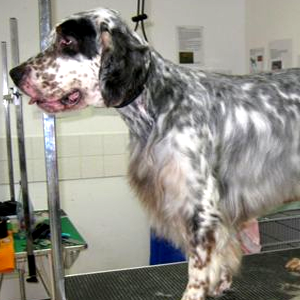 I’m now pleased to offer my dog grooming services from a purpose-fitted dog grooming salon in Eardisley. Operating from the salon means that I can now offer a more open environment in which to care for your dog. I have plenty of free parking available. My premises, which opened in April 2012, are open-plan enabling you to see how clean, safe and friendly the dog grooming room is before entrusting me with your pet. When designing the salon I felt it was important for my clients to be able to see everything that goes on. I remember the feeling of dread I used to have when dropping my own dog off at the groomers and watching him being taken through a door into a room I couldn’t see for myself. So whether you’re a new or existing client, get in touch today to book your dogs next grooming session I have appointments available over 7 days from 0800 to 1800. I’ll look forward to seeing you in our new salon but more importantly I look forward to seeing your dog! I also offer a collection or delivery service for your dog which is free within a 7 mile radius. For greater distances please contact me for a quote.